A-HOTEL.com - Luxury and cheap accommodation in Bystrc, Czech Republic. Prices and hotel, apartment booking in Bystrc and surrounding. Found a 5-minute drive from the Brno dam, the Alfa Panorama Brno is situated in a modern building and offers free WiFi and free parking. The studio is fitted with a TV, a sofa and a washing machine. Hotel Rakovec is located on the banks of the Brno reservoir, 200 metres from the ship pier and 10 km from the city centre. It offers panoramic lake views, wellness, free parking and free WiFi. Situated in a quiet area close to the Brno Lake, Hotel Atlantis offers an outdoor pool and a wide range of sports facilities. It also features an à-la-carte restaurant with a terrace, serving Czech cuisine. Situated above the Brno Reservoir in Kníníčky district, Hotel Fontana features a wellness area including an indoor pool, a fitness centre, massages treatments, and provides Wi-Fi for free. All modern rooms comprise a seating area, a private bathroom and balcony with a spectacular view of the dam. The Hotel U Šuláka is located in green surroundings close to the Brno reservoir, 9 km from the city centre, and offers you free Wi-Fi. Tasty Czech cuisine is served in the restaurant and a rich buffet breakfast can be enjoyed every morning in the Hotel U Šuláka. Brno lake summer B&B is situated in Rozdrojovice. All rooms feature a kitchenette and a private bathroom. Hotel Prosperita lies on the outskirts of Brno in a quiet, forested area. The hotel features a bar and a naturally-shaded garden and terrace. GP Hotel Kolejní is set in Medlánky and has a terrace and a bar. Boasting a 24-hour front desk, this property also provides guests with a restaurant. Boasting a sauna, VILA PRYGL **** BRNĚNSKÁ PŘEHRADA is situated in Brno. The villa has access to a restaurant and free WiFi. 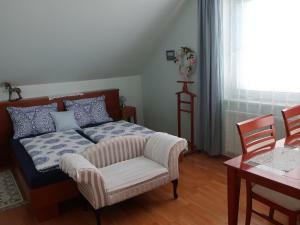 The charming, family-run Pension Edison is located in the northern part of Brno, in the area of the technology park. It is easy to reach from the E461 motorway Brno-Svitavy and from the D1 highway. Boasting garden views, Modern Apartment Brno is set in Brno, around 4 km from Špilberk Castle. The Trade Fairs Brno is within 6 km of the apartment, and free WiFi is provided. AS Hotel is located in Brno-Jundrov, 10 minutes’ drive from the city centre and 15 minutes' from the Masaryk Circuit. Free WiFi is provided in the entire building. Located in Brno, in a building dating from 1970, 5 km from Trade Fairs Brno, Penzion Vanessa features a garden and guestrooms with free WiFi. Built in 1970, the property is within 5 km of Špilberk Castle. Situated 3.7 km from Špilberk Castle and 6 km from Trade Fairs Brno, Apartmán 2 is in Brno and features a garden and a terrace. Set 3.7 km from Špilberk Castle in Brno, Apartmán v dobré lokalitě offers accommodation with a kitchen. The non-smoking Hotel Vista in Brno-Medlánky is a 10-minute ride by a direct tram from the city centre. It offers modern rooms, free internet and free secured parking. Situated in Brno, within 3.8 km of Špilberk Castle and 6 km of Trade Fairs Brno, Haas Apartments offers accommodation with a flat-screen TV and a kitchen.